How often are you likely to give someone a second chance? More than two years ago I asked my husband if we could get another dog to keep Baci company during the day. For those who don’t know, Baci is my four year old labrador. At two years old I thought it was about time Baci got a companion. So after some persuading, and some research we got a little labrador from a breeder. Her name was Bisous. As all labrador puppies are, she was adorable (and yes I am biased!) but other than that, there isn’t much that I can say about her because I hardly got to know her. For three days she was with us, I would take Baci for a walk very early in the morning (as I always do). Bisous was too small to leave the house so I left her in the house while my husband slept. Every morning as I started walking up the road I heard Bisous whimper and then she started yowling and I said to myself that she must be lonely but she would eventually stop after a few minutes. Coming back around 30 minutes later, she would still be crying when I got home. One day I got home and my husband met me at the door – he was frantic. “Guess what” he said. “Bisous has been crying the whole time”. “Oh no…” I closed my eyes and prepared for the worst. “The neighbor came, complaining. They said if I didn’t make her shut up – they would!” he added. To make a long story short, I called the breeder and asked her if she could take back Bisous for a few weeks and train her to be “more independent” – maybe teach her to be on her own a few hours a day so that when she came back to me she wouldn’t cry like she did that first morning. The breeder was kind enough to agree so that night my husband and I went to take Bisous back. On the way home I was full of guilt and confusion about what I had done. I started crying and telling my husband that we should have tried harder to train her, that he should have just woken up the same time I did every morning and kept Bisous company while I walked Baci. Then, my husband said something that just made everything clear. Truth was, I wasn’t. We were working 12 hour days there was just no time for a new addition to the family. The next day, I called the breeder who understood and was even grateful for my honesty. But I really felt like I blew it. I had lost my chance at getting a companion for Baci. Six months later, my parents came for a two month holiday and I decided then that this was the right time to get a new puppy. After all, my Dad was an early riser, he could keep the puppy company during the day and while I walked Baci (strangely enough, the new puppy never cried when we left her alone). Again, after much persuasion (even more than the last time! ), we got Bizou. When I look back at the events that took place in order to get Bizou, I think “how stressful!”. But then when I am sitting on the lounge, and she jumps up and lays by my side and rests her head on my lap – I know it is all worth it. I am glad to have had a second chance. Some recipes also deserve a second chance. Like this one here. When I first started blogging I wrote about how I learned to make this recipe after attending a class at the Council of Italian Restaurants in Australia. This recipe was passed on by Logan Campbell, the head chef at Lucio’s restaurant. Lucio’s is a two hat restaurant (awarded by the Sydney Morning Herald’s Good Food Guide) and one of Australia’s finest Italian Restaurants. To be perfectly honest, I was not planning to blog about this pasta dish as I had already done so in the past. But I made it tonight for a family dinner and I had to go back to my old post to look for the recipe. I saw the old pictures and I thought I didn’t really do justice to the dish. It is such a delicious recipe that I knew it deserved… a second chance. Pour flour onto benchtop and make a well in the centre. 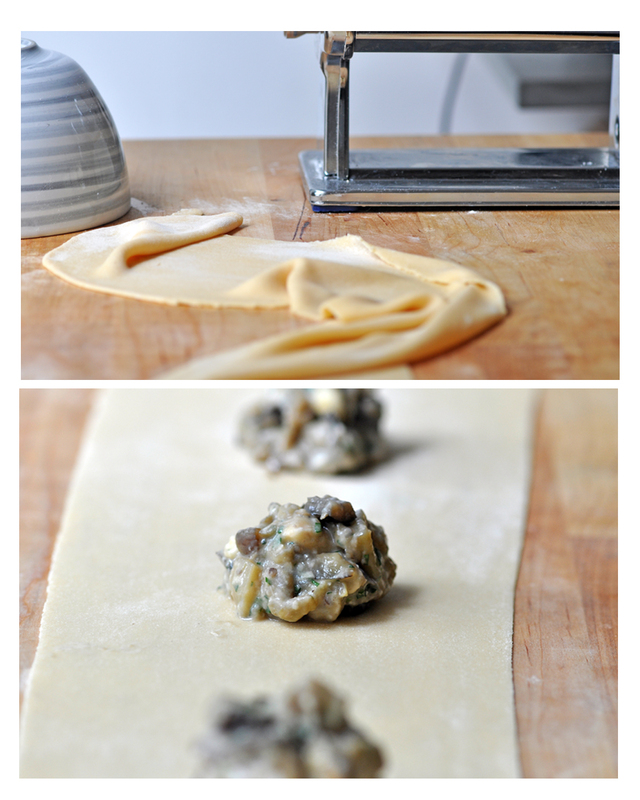 Using a pasta machine roll out the dough until a thin sheet is formed. Brush with egg wash and place some the ravioli mix along the sheet 3 centimeters apart. Roll another sheet and place on top of the first, pressing down around the mix to remove any air pockets. Using cutters, cut the ravioli out removing excess dough around each one. Place on a floured tray and cover. Blanch the ravioli for three minutes the drain. 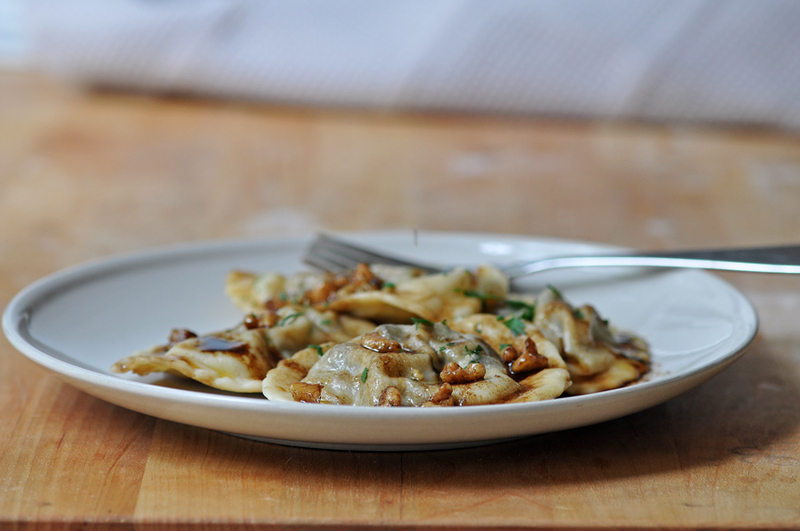 When the butter is brown and foaming, add the pasta, balsamic vinegar and walnuts. We had a heap of Augergines harvested from our garden and were looking for some inspired recipes. This looked so gorgeous that I made it with my girls and it was beautiful!! Had some left over filling and had it on toasted bruchetta the next day – yummm!! 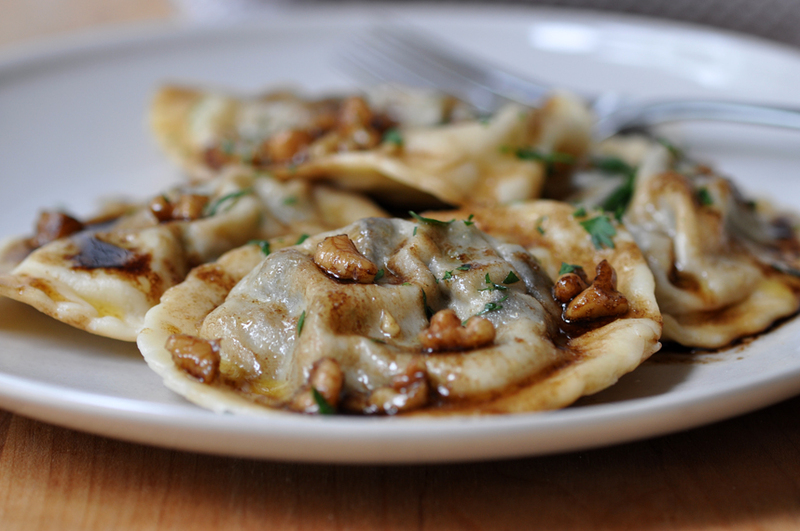 This eggplant ravioli sounds really good! Such a lovely story and a happy ending =) Looks so good! Love the eggplant and how you served it. I had this for dinner the other night – what can I say? Super as usual! Thanks Tris! Nice story and glad to see that it came to a happy ending. Did the second round of photos do the pasta dish justice? Haha Simon – second round of pictures – can’t really say if it did justice – I would say definitely more than the first! Every recipe deserves a second chance and this one is worth posting it again. Great photos. This is something different recipe and I think it takes time to make this.It seems delicious.I agree with you that this recipe deserves a second chance.Thank you very much for this tasty recipe of eggplant ravioli. A superb meal!! I love making my own pasta with my pasta machine!! It is fun, fun, fun!! A lovely & excellent filling too, Trissa! I wish you & your family a healthy, fun & apart 2010!!! Thanks for sharing such a lovely, touching story. Totally agree with you about the second chance. But I’ve found the beauty in going beyond the 2nd chance, whether it’s people, cooking or other things. Love your eggplant ravoli. Happy holidays, Trissa! I believe that there must always be a second chance. And happy to hear that Baci has a companion now. Right time is very important for such events. And this ravioli looks absolutely so yummy! I love eggplants and walnuts. So this is so much appealing for me. I have tasted this pasta at your house. It was so good and definitely worth a second chance… R u using your macron lens? Love all the close up shots! Hi Ellie – Yes the macro lens! Still trying to get the hang of it but taking awhile! Maybe I need to read the manual! LOL! The recipe looks good too! I’m glad you were honest! It wouldn’t be fair to Bisous otherwise =D. 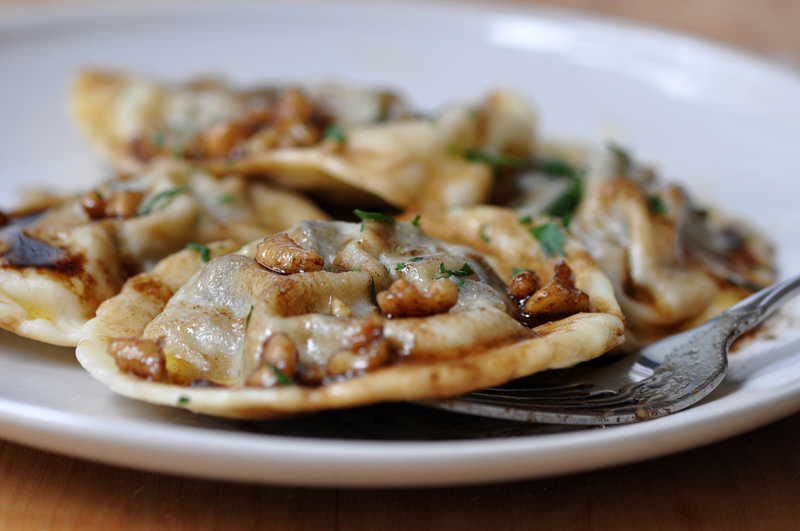 This ravioli is hunger-inducing! I love it so! Oh yum! I wish I had a pasta maker! It looks delicious! This looks brilliant… the tallegio is inspired.. thanks for re-posting since I missed it the first time around. This looks delicious! Thanks for this great story. Getting a puppy is not easy, but everyone deserves a second chance. And your husband is right, it is all about timing not because you didn’t try harder. Hi Trissa, love your story about your dog. I am not an animal person – have been terrified of cats all my life and have just been able to take to dogs 5 years ago when my friends started bringing their dog over to my place when they came visiting…. Your dogs are beautiful. By the way, I got my Ego light. Thanks for your help. Now, I need to graduate from my compact camera to a decent DSLR! Happy Holidays! I’m glad you were able to create a home for Bizou. I feel the same way about Tabitha cat – we are her second chance! And your photos of the eggplant pasta are lovely. What a great story – I am so glad that Bizou has become a treasured member of your household. This pasta looks devine – and it would have been fabulous to take classes with the real pros at Italian cooking. This dish looks delicious! It was probably better to wait until the moment was exactly right to be able to take care of Bisous. I love labradors, they are the most beautiful dogs, I miss mine just writing this! This recipe looks lovely. Moving story too, glad everything worked out. I absolutely adore this recipe. It’s so delicious. I’m glad you posted it again. It’s angreat vegetarian dish. I don’t like eggplant that much but this looks really yummy! Second chances are a good thing. With people, animals or recipes! This looks delicious, so I’m so glad you posted it!